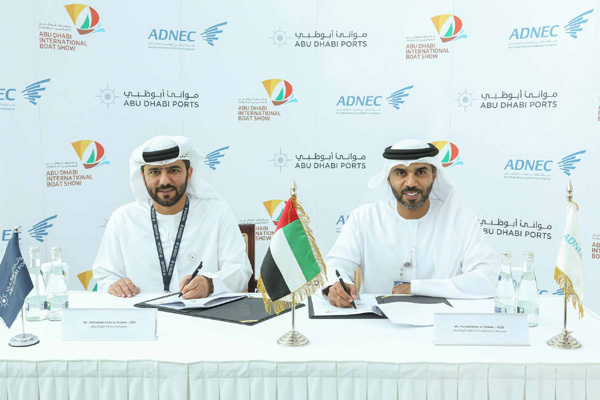 The Abu Dhabi National Exhibitions Company (Adnec) has signed a strategic sponsorship agreement with Abu Dhabi Ports for the of launch the emirate's first boat show. Taking place from October 17 to 20, the Abu Dhabi International Boat Show will be held in association with the British Marine, the membership organisation for the UK leisure, superyacht and small commercial marine industry and aims to enhance Abu Dhabi’s position as a prominent leisure marine luxury yachts tourism destination. Captain Mohamed Juma Al Shamsi, CEO of Abu Dhabi Ports Company, lauded the distinguished efforts made by the government and public-sector organisations to further enhance the business tourism segment and improve Abu Dhabi’s position as a leading destination across this vital sector. “Abu Dhabi has been witnessing a growing number of passengers at its cruise terminal area over the last few years. The pioneering edition of the Abu International Boat Show, which is set to attract exhibitors and visitors from around the world, will contribute in the ongoing efforts to introduce the unique features offered by Abu Dhabi and the UAE’s marine tourism sector,” he added. Al Dhaheri said that these partnerships represent an important step towards ensuring the success of the inaugural edition of the Abu Dhabi International Boat Show, which is expected to be a breakthrough event in the leisure marine and luxury yachts industry. The event offers long-term partnerships to make Abu Dhabi a global destination for leisure marine tourism taking into consideration that the emirate boasts over 200 islands, stunning coastlines and beaches. Al Dhahiri explained that Adnec is looking forward to meeting the needs of Abu Dhabi’s leisure marine and luxury yachts tourism, an important component of the marine tourism sector. The company has proven expertise in successfully hosting premium global events over the last 10 years. This completes its efforts to support Abu Dhabi’s economic diversification and promote the tourism sector in line with Abu Dhabi’s Economic Vision 2030, which aims at making the capital a leading cultural and tourist destination regionally and internationally, while enhancing its position on the global tourism map. Among the sponsors and partners of the Abu Dhabi International Boat Show (Adibs) are the Abu Dhabi Department of Culture and Tourism, Al Suwaidi Marine, Mercedes - Emirates Motor Company, Integro, The Captain’s Club, Abu Dhabi Health Services Company (Seha), Jalboot, Delma Marine, Marine Concept, Hydro Water Sports, Greenline Yacht Interiors and Emirates Palace Hotel. Adibs is expected to attract 150 exhibitors and 20,000 visitors and will feature 75 boats berthed at the Adnec marina recently extended to increase capacity, to meet the growing demand. With its rich marine life, the emirate boasts 400 km of coastline and over 200 islands to be explored.